I think it is very fitting that he should be buried at Wooster as so many years of his life were spent there, and I suppose it was his wish to be buried there…. How does Mother’s grave and lot look? Has anything been done to it or has it been neglected? If so won’t some of you please have it fixed up and plant something on it. . . . I’ll enclose a few white cosmos. . .flower seeds which I wish you would plant on it and sometime I’ll send some for Father’s grave. For Henry Davidson’s second family, Frances and her seven siblings—Lydia Davidson Brewer, Rebecca (Becky) Davidson Dohner, Emma Davidson Diehl, Henry Davidson Jr., Henrietta Davidson Brechbill, Albert Davidson, and Ida Davidson Hoffman, dispersed as they were from Kansas to Colorado to Indiana and across the sea to South Africa—it symbolized the family’s fragmentation to have their mother lying alone in Abilene.10 Frances’s letter written from southern Africa to her sisters in Kansas suggests that even from the distance brought by mobility and death, there was a force that maintained the family unit. Thoughts of white cosmos growing from seeds shipped from her home on the dark continent perhaps alleviated something of the deep loss that Frances felt both in the geographic dispersal of the family and in the ultimate separation of death. There was little by way of salary, and if a minister were to fulfill his obligations to itinerate, he needed the full support of his wife and children. His wife, with the help of the children, would run the family farm while he travelled from preaching point to preaching point. During Henry’s and Fannie’s growing up years, these trips—as much as 150 miles—were made on horseback, through all kinds of weather.29 To make it possible for their minister husbands to serve the church, we can imagine Frances Rice and Mary Magdalena Davidson taking on farm management, in addition to their household work, to sustain the family enterprise. The Scotch-Irish restless and enterprising spirit saw the Davidsons uprooting in mid-life, to resettle in Fayette County, just south of Westmoreland. Leaving farm property in the hands of Henry’s eldest brother Samuel, Jacob and Mary re-established themselves and their younger children among the Scotch-Irish and German communities along the Monongahela where it flowed into the Ohio River. Although the record is silent regarding their motive for the move, the town of Brownsville where they situated themselves was an important centre on the National Road that provided “a route through the mountains for settlers heading west.”34 The family’s re-location to this thriving industrial community with its shipyards and strong economy would shape 14-year-old Henry’s destiny. Jacob purchased the large tavern on the Basil Brown tract two miles east of Brownsville that he and Mary Magdalena would convert into a large home. Built as a hotel in 1812, for 25 years it had been frequented by wagoneers and drovers. Now in their 50s, the senior Davidsons shared the home with their son Jacob Junior and his wife Hannah Kelly Davidson and their growing family, along with their own children still at home. What was the push for this move? It may have been to leave their mill wright enterprise behind, and to give the younger children a new start in a thriving industrial centre. Indeed, Jacob Jr. must have been showing signs of silicosis, the disease caused by “breathing of rock dust,” with its symptoms of coughing, loss of appetite, and strength that took its toll after only a few years of working in the millstone industry, and would cause his early demise.35 Perhaps Jacob himself also suffered from the disease. Meanwhile two years into his life with Hannah, Henry was ordained. Settling into the tiny Fayette County River Brethren community is puzzling; his father and his father-in-law served as ministers in the much larger United Brethren in Christ denomination; his grandfather had been ordained in the Presbyterian church.40 Perhaps Henry’s mother’s Lancaster County connections brought him into contact with the River Brethren; they did hold similar values and practices as the United Brethren in Christ, including the Anabaptist influence manifested in their common pacifism and strong communities. As the United Brethren in Christ had become preoccupied with institutions and structures, he may well have been drawn to the less formal and more enthusiastic worship and warm spiritual expression of the River Brethren. Whatever the reason, in this time of “extraordinary mobility in the United States,” as Henkin has named it, the push of a declining economy in Brownsville, and the pull of a call by the small group of River Brethren in Ohio, found Henry and Hannah immigrating west.41 In that environment Henry would develop as a leader, holding significant influence in his chosen denomination, and when Hannah died an untimely death, Fannie’s and Henry’s lives would come together. Although Baker would move on to Ashland to take up a career in medicine, Davidson would re-locate to Wayne County, where he established his growing family on the highly arable land once farmed by an indigenous population. 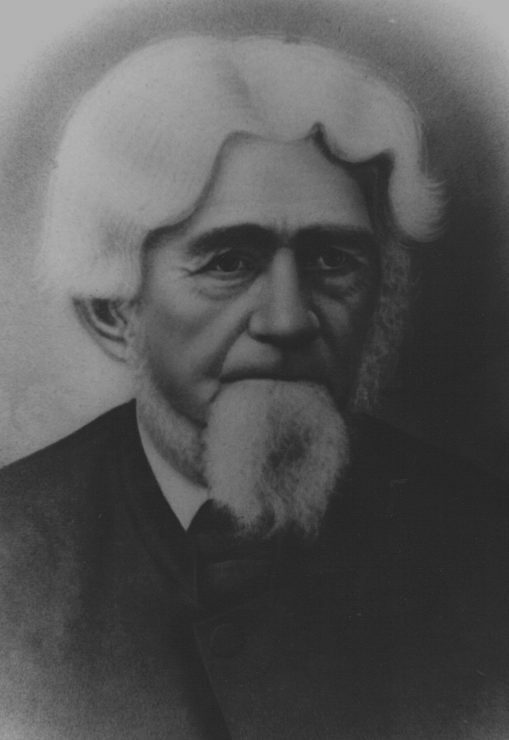 For the next 25 years, he made his life among the Pennsylvania German immigrants with such names as Zimmerman, Harzler, Amstutz, Conrad, Martin, Yoder, Myers and Stuckey who were establishing communities of Amish, Church of the Brethren, and Henry’s denomination of origin, United Brethren in Christ.45 From Ashland County where William Baker would make his life as a family doctor, he and Henry Davidson would become fast friends and colleagues, working together amidst the difficulties that life brought them, to help build the community of River Brethren that was emerging in Ohio. Henry and Fannie Rice Davidson (older couple in the middle). This photo is cropped from a large photo of what was probably a family reunion. Photo courtesy of the Brethren in Christ Historical Library and Archives. Two years after their marriage, Henry moved his growing family that now, along with Hannah’s five—Mary, Sarah, William, Carrie and Isaiah—included Fannie’s new baby Lydia, to Wayne County. Having purchased a farm near Smithville, they would be closer to the little River Brethren community where W. O. Baker had been baptized two years earlier. With the growing presence of the Church of the Brethren, and a United Brethren in Christ church in the area dividing the German population, the Davidsons must have been a welcome asset to the tiny River Brethren community. 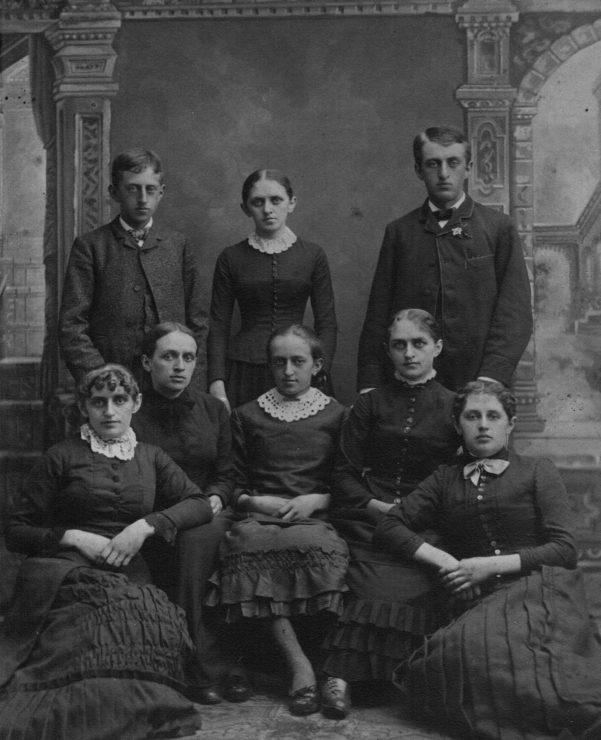 According to Baker’s “Recollections,” when the family “moved into the church” it was still “composed of the four old members.”59 What with Henry’s vision and calm leadership style, Fannie’s capability and commitment as a minister’s wife, and the rapidly expanding Davidson family, the church would grow to become a significant presence in Wayne County. 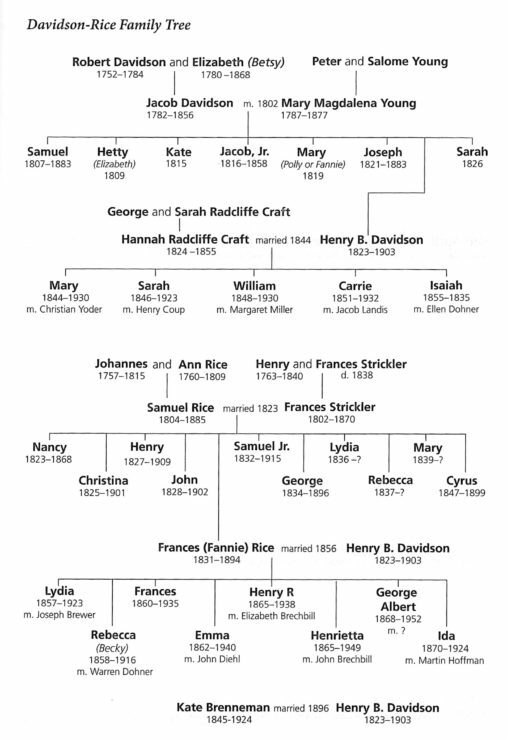 The family of Henry and Fannie Rice Davidson. Back row, left to right: Albert, b.1868; H. Frances, b. 1860; Henry R., b. 1865. Front row, left to right: Lydia, b. 1857; Beckie, b. 1858; Ida, b. 1870; Emma, b. 1862; and Henrietta, b. 1865 (twin with Henry). Photo courtesy of Brethren in Christ Historical Library and Archives. An 1873 map of Wayne County delineating farm properties confirms that the Davidsons were counted among these wealthy citizens. With the purchase of additional land, the Davidson property was 50 percent larger than any other in the neighbourhood, and triple the size of many. With the brick house built on the property, the Federal Census of 1870 gave Henry a real estate value of $23,500 with a personal estate of $2500, well above what neighbouring farmers were worth; for instance, the farm of his closest neighbour, Jacob Doner, was evaluated by the assessor at $12,800 with a personal estate of $1800. Similar to other farmers who supplemented their family living by working as butchers, blacksmiths, ditch diggers, tanners, carpenters, stone workers and threshers, further remuneration from the cheese factory Henry ran in Easton for a time would have also helped feed the many mouths in the household and provide them with an education. 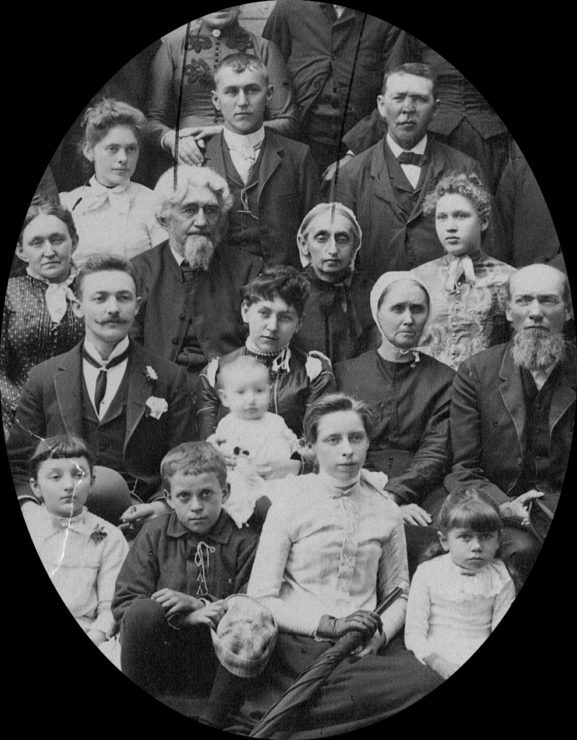 If the Davidsons are any indication, the Brethren in Christ community must have been viewed by the surrounding community in as positive a light as their sister denomination immortalized by a glowing report on the Church of the Brethren (German Baptist) council published on May 22, 1872 in the Wayne County Democrat: “Despite their peculiarities of Faith, which they consider nothing without Works, the reporter described them as thrifty, economical, industrious and the best, wealthiest and mildest of citizens.” Railroads crisscrossing the country brought no less than 5,000 German Baptists to the Hoover farm in Paradise where Henry’s friend and colleague W. O. Baker had been baptized into the River Brethren community some 15 years earlier. Delegates to this Church of the Brethren council included six hundred preachers, arriving from Indiana, Ohio, Illinois, Iowa, Maryland, Virginia, West Virginia, Tennessee, Missouri, Kansas, New Jersey, Minnesota, and Michigan, along with the editor of the denomination’s Gospel Visitor. ((“German Baptist Church,” 18-19; see also Durnbaugh, Fruit of the Vine, 320; Martin Marty, Pilgrims in their own Land: 500 Years of Religion in America (New York: Penguin Books, 1984), 310.)) 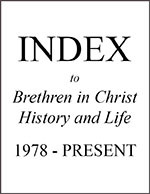 Although history is silent on Brethren in Christ involvement with this particular council, according to Wittlinger, with the closeness in their belief and practice, the two denominations had considered merging.74 Indeed, 15 years later, the Brethren in Christ were ready to launch their own publication with a strikingly similar name. With Frances’s return home, Henry Davidson sold his Ohio farm; with his five older children settled–four in Ohio, and Carrie in Abilene, Kansas–he moved Fannie and their eight children from their large brick home in Smithville.87 The family, now ranging from 23-year-old Lydia to Ida, just nine, re-configured itself in a frame homestead in White Pigeon, Michigan. Approaching 60, Henry devoted himself to mission on the American frontier, while he waited in anticipation for the fruition of his vision for a denominational paper.88 In the meantime, Frances continued her education at the Baptist College in nearby Kalamazoo; in 1884, three years after the family’s move to White Pigeon, Frances achieved a Master’s degree, the first in the denomination.89 Her literary skills would prove invaluable during the paper’s first year. on several occasions when the discussions as to various problems of the Church became overly warm Bishop Davidson would stand and say, “Now, Brethren. . . .” and then proceed to lay the foundation for a peaceable settlement of the discussion. On the home front, Henry was committed to finding Brethren in Christ spouses for at least some of his children. To be sure, the United Brethren in Christ mission endeavours had resulted in growth in Michigan, but it was Brethren in Christ connections that Henry sought;92 his evangelistic and preaching trips provided the opportunity. With the social limitations of the small Brethren in Christ presence in Michigan, the long-term relationship with Jacob and Sarah Brechbill in Auburn, Indiana, dating from their Stark County days, provided for marriages for twins Henry Jr. and Henrietta. It must have been a difficult period for Henry Davidson, his friend W. O. Baker, and the small handful who supported the idea of a church paper. Discussion languished for years, only to be revived and opposed again. After 13 years of careful consideration, at the landmark 1887 General Conference held on Cyrus Lenhart’s Pennsylvania farm, the church responded positively to Michigan district’s petitions: the Brethren in Christ were finally ready to risk a new mode of communication. A committee of five, with Davidson and Baker at the helm, were given a four-year mandate to test the waters. Henry enthusiastically took on the mantle of first editor and in just over three months, he had the first issue to press. The words, “Devoted to the spread of evangelical truths and the unity of the church,” as proclaimed the Evangelical Visitor‘s mast-head, described his vision. I desire to sell my farm of 145 acres. It is a beautiful home, good building, near to R.R., level land, easy to cultivate, and in a healthy country. It is necessary that I should sell the farm, or give the publication of the Evangelical Visitorinto other hands. For particulars address the undersigned. Henry Davidson. Photo courtesy of Brethren in CHrist Historical Library and Archives where a framed version of this portrait hangs prominently. Henry’s editorial wisdom helped the Visitor quietly bring the Brethren in Christ into the evangelical mood of the time. Pieces selected from other papers subtly introduced the denomination to the large communication networks that were key to giving the nineteenth century evangelical movement shape.108 More explicitly, the paper gave expression to Davidson’s vision of moving the denomination out from its insulated farm communities to broaden the denominational perspective through education and mission. she met the final change in a glorious triumph of faith in her Redeemer. The writer of this notice frequently visited her during her affliction and always found her resigned to the will of the Lord; but the last visit a few days before her death was especially encouraging. While in conversation, she all at once cast her eyes upward and shouted while clapping her hands: ‘Oh, praise the Lord – Glory! – Oh, I am so happy in the Lord.’ She continued in that ecstasy of mind until she became unconscious, and she calmly and peacefully passed away. Assumed but unspoken was the support of his wives, none more than his partner of nearly 40 years, Fannie Rice Davidson. Her labour and contributions to his ministry are summed up in Frances’s lament on her mother’s death: “what is a home without a mother? No home.” Few words survive that would help today’s reader understand Fannie’s part in Henry’s ministry, but we can read something of Fannie’s character from what we know of her daughters. We can be sure that Fannie’s intelligence, wisdom, and strength, passed on to her children, not least her namesake H. Frances Davidson, were crucial to the success of Henry’s ministry and legacy.128 Although few of their descendants remain within the Brethren in Christ denomination, the Davidson vision that brought the denomination into the nineteenth-century evangelical world of communication, education and global mission has inspired the church for well over a century. Lucille Marr is chaplain and academic dean at The Presbyterian College, Montreal, and adjunct professor at McGill University School of Religious Studies. She has published a number of articles and books on Mennonite and other church history. Read more articles by Lucille Marr.